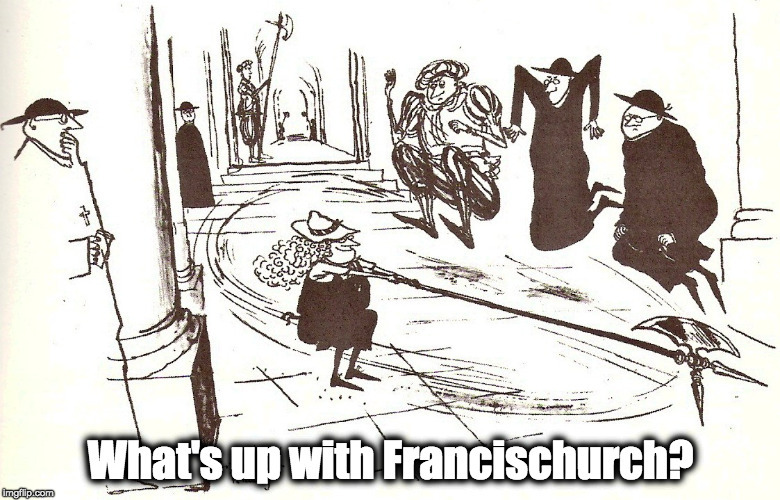 Father Międlar’s Speech – What's Up With Francis-Church? The migrant crisis continues unabated, although now even more complicated by the Paris attacks and the revelation that parts of Brussels have been occupied by Morocco. North Americans who love 20th century French films have been brought up to speed on the new demographics, 16 years after I was amazed and frightened to discover a large gang of young African men catcalling women from the steps of the Gare due Sud at 1 AM. Last year I was diverted by the fact that almost everyone I saw working in Charles de Gaulle Airport was of African extraction. The French stopped replacing themselves with babies while Africans from the former colonies moved in. That’s the story, morning glory. Truth is what is. I hope the New French preserve la gloire de la France as well as (or better than) the Old French, and it must be observed that there are not a few New French in the police force, military and national football team. Like South Africa, France is a multi-racial, multicultural country, as is England and, increasingly, Germany. However, there is strong resistance to the Rainbow Nation ideal in countries which are not yet multi-racial or multicultural, but merely have small minority ethnic groups which go along to get along. If you want to know what the Average European Joe thinks, get on YouTube and listen to the chants of football (soccer) fans. They’re mostly male and they don’t mince words. To spare your blushes, I will tell you that Polish football supporters don’t want the current ethnic make-up of their nation to change. This view is not shared by all Polish politicians, clergy, journalists, university students, et al. 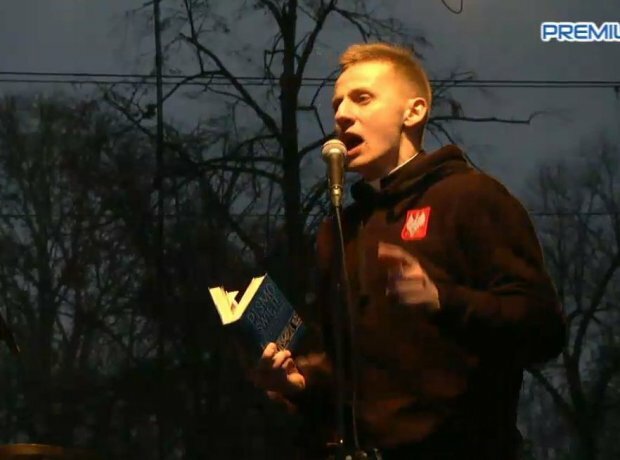 In fact, I know of only one Polish priest who is willing to go out to the margins where skinheads are burning non-Poles in effigy and yelling “**** the refugees” and, while agreeing that Islam has no place in Poland, cautioning the boys that blind hatred is not okay by the Gospel. Here, as previously promised, is Fr. Międlar’s speech, translated by a certain Piotr and then tidied up by me. I am told by a Polish reactionary that seeing such politically incorrect Polish thoughts in sober English is very funny; my eyes almost fell out of my head. Crowd: Forever and ever, amen! JM: Dearly beloved, the enemies of the homeland and the enemies of the Church are furious today because they see a huge, enormous army of patriots, army of nationalists, and army of [football] supporters who have ‘God, Honour,and Fatherland’ in their hearts and are ready to give their lives for them. But I am more than convinced that leftist propaganda is trying its best to destroy us, to destroy the Church, to destroy the Polish nation. We cannot let them do it. We are the Church Militant. We are the warriors of Great Poland. They aren’t even aware that the more they attack us, the more our pride grows! Pride! Crowd: Pride! National pride! Pride! Pride! National pride! Pride! Pride! National pride! JM: Dearly beloved, I think all of us see that we are neglected in the public debate. No-one wants to listen to us though we are the future of the Great Catholic Poland. We’re aware of our roots. We’re aware of our National-Christian heritage. And we are ready to fight for this heritage till the last drop of our blood! God! Honour! Fatherland! Crowd: God! Honour! Fatherland! God! Honour! Fatherland! God! Honour! Fatherland! JM: Many would like to close our mouths. Many would like us to shut up completely, and not fight to defend the Catholic Church, not fight to defend our homeland, our love which is the Polish nation. Dearly beloved, we cannot stop. We must fight. We must go to the peripheries of the faith, to those peripheries to which Pope Francis wants us to go. We must go, according to the words of Saint Paul the Apostle, who said: “my honour is to go to those who do not yet know Christ” [Romans 15:20]. We must go out of the temples, out of the sacristies, out of the rectories. We must go to preach the Truth and Christ. We must go, dearly beloved. And be ready. Be ready to be spat at. Be ready to be persecuted. But our strength, our courage, is in the only Lord and Saviour, Jesus Christ! It’s us! It’s us! Crowd: Poles! It’s us! It’s us! Poles! It’s us! It’s us! Poles! It’s us! It’s us! Poles! JM: Dearly beloved, you are the great army of the Church; you are the great army of Poland. I don’t know if you have noticed, but history once again repeats itself. In 1944, we were told that the Soviets were our long-awaited guests; in 2015, we are persuaded and pressured with Islamic fundamentalism. We’ll never allow it! JM: Dearly beloved, we’re not afraid of the peaceful Muslims, but they’re a minority. We’re afraid of fundamentalism. We do not want violence, we do not want aggression in the name of Allah, we want neither lynching nor terror. We must oppose it. We do not want the hatred that is in the Koran, in Surah 5 [expressed for Jews and Christians], but we want the love and truth of the Gospel. We want to fight with the sword of love and truth, to which Saint Paul the Apostle calls us in the 6th chapter [of the Epistle] to the Ephesians [6:14-17]. The Gospel, and not the Koran! Crowd: The Gospel! And not the Koran! The Gospel! And not the Koran! The Gospel! And not the Koran! JM: Dearly beloved, leftist and Islamic aggression aimed at everything Christian and national makes us very afraid. And we have the right to be afraid! We have the right to be afraid, to fear the downfall of the National-Christian heritage. No-one can deprive us of this fear. But we’re also afraid that our fear will turn into hatred. And we, as Christians, cannot let this happen. That’s why we, the Christians, want dialogue. But no-one wants to talk to us, instead calling us fascists, racists, xenophobes, and infidel dogs. We can never allow this [succumbing to hatred]. We don’t want to fight with the hammer of hate they [the left-wing] want to push in our hands in the fervor of frenzy. We want to fight with the sword of truth. With the sword of love! With the word of the Gospel! With the Sword that is Jesus Christ, our living Lord and Saviour. God! Honour! Fatherland! JM: Dearly beloved, you are the future of the Church. You are the future of the Polish nation. So let’s build the Polish nation, let’s build Great Catholic Poland on a full foundation, which will not be destroyed by anything or anyone. Let’s build Great Catholic Poland on a foundation of truth, love, and on the foundation which is the sole Lord Jesus Christ. Great Catholic Poland! JM: And now, dearly beloved, because this is the March of Independence, I’d like to ask you all for a minute of silence. This minute of silence we’ll dedicate to our biggest national heroes, the Steadfast Soldiers [who fought both the Nazis and the Soviets] , and all those that through the history of our nation have fought for our freedom. Please, be silent for a minute. The crowd lights flares and remains quiet for a minute. JM: Honour and glory to the heroes! Crowd: Honour and glory to the heroes! Honour and glory to the heroes! Honour and glory to the heroes! JM: Neither Islamic, nor secular, Great Catholic Poland! Crowd: Neither Islamic, nor secular, Great Catholic Poland! Crowd: Neither rainbow-hued, nor red, only national Poland! JM: Dearly beloved, let us pray to the one that has so often rescued us from Islamic invasions, who rescued us from the [seventeenth century] Swedish Deluge and the  Bolshevik invasion. Let’s pray to Our Lady, the only Queen, Mary the Queen of Poland. We fly to thy protection–! Crowd: –O holy Mother of God. Despise not our petitions in our necessity, but deliver us always from all dangers, O glorious and blessed Virgin. Our Lady, our Patroness, our Mediatrix, our Joy. Reconcile us to your Son, commend us to your Son, present us to your Son. JM: For building a free Poland, and for building the Church with Christ at the centre, be blessed by the Omnipotent God on the name of the Father, the Son, and the Holy Spirit. JM: Glory to Great Poland! Crowd: Glory to Great Poland! JM: Poland is safe with you. Thank you. He raises the Bible and then kisses it. Dorothy Cummings McLean fled from Boston College in 2007, jabbering about the Antichrist, and was swiftly put on anti-depressants. Since then she has written several books (two published), gotten married, moved to Scotland, travelled about Europe, learned Polish and generally had a wonderful time. Having just bought a bottle of Soplica at the Krakow duty-free, she is all set for the end of the world. A priest with a spine, how refreshing! That we had a thousand like him. We need more men like this priest and his words everywhere. Races cannot be judged, cultures can, because it is a choice to go along with or to resist cultural practices, whereas you cannot choose who your parents, or what your genes, will be. Inspiring. I did chuckle at this: “We must go to the peripheries of the faith, to those peripheries to which Pope Francis wants us to go.” I don’t think fighting to defend our homelands or to spread the Truth of the Catholic Church is quite what Francis had in mind. Moving and inspirational. One would suppose, however, that when Turkey joins the EU in the near future her nationals will enjoy a legal right to stampede wherever they might throughout the continent. That would be around 75 million or so left footloose and fancy free.